Here it is! 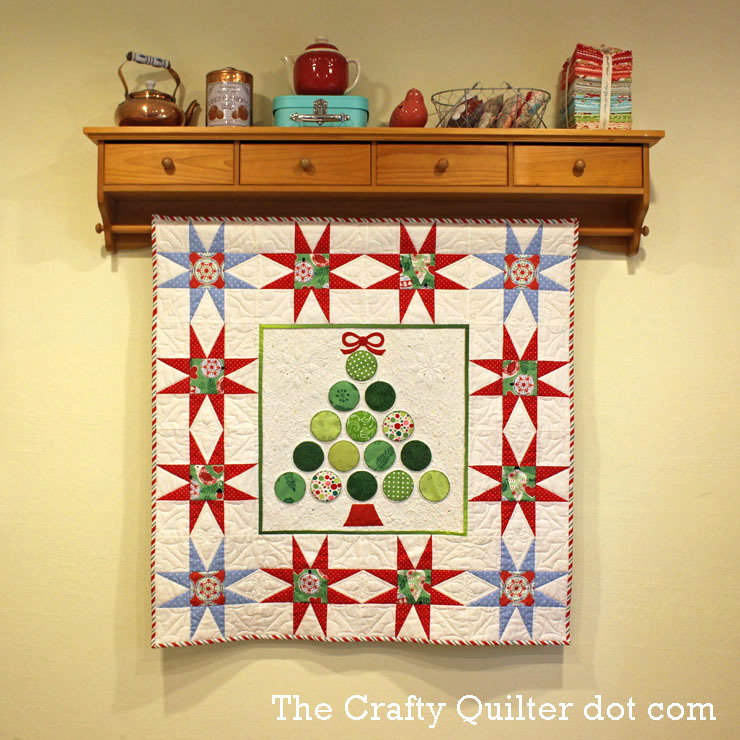 The November edition of Christmas Once a Month is a Christmas Tree Wall Hanging. Some things are worth waiting for! This is plan B and I am so happy with how it turned out! 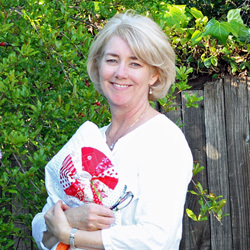 (Plan A was a Christmas stocking, but I just wasn’t feeling it.) This is the perfect size to use as a wall hanging, but it could go on a table, too. Many of the fabrics I used came from Maywood Studio’s collection, All Wrapped Up, as well as a good dose of my own stash thrown in. I especially love the striped binding that I cut on the bias. and holly leaves in the open spaces…. All seam allowances are 1/4″. 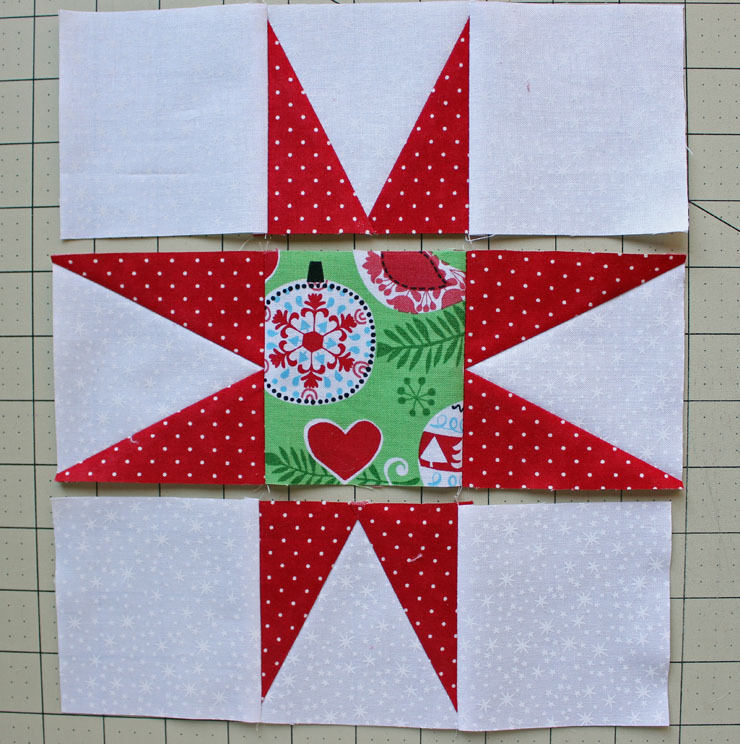 I’m going to start with a lesson on constructing the star blocks in the border. 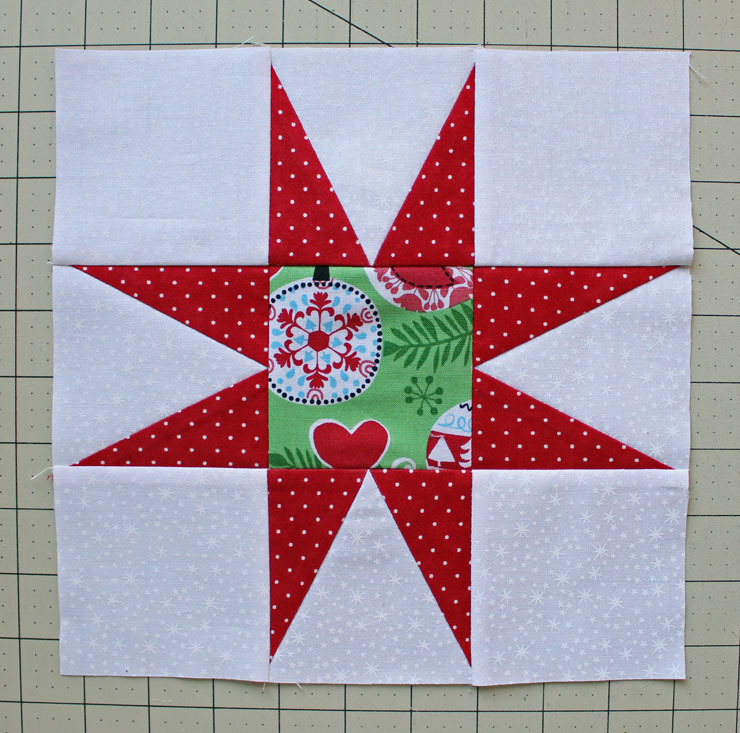 I know there are many methods and rulers available to make the star points for this block. 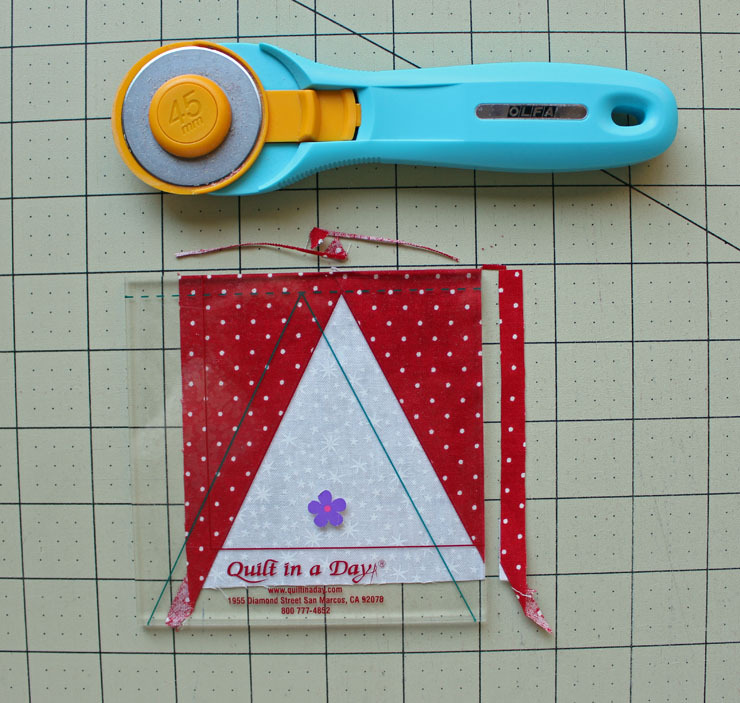 My instructions use the Triangle in a Square ruler by Quilt in a Day. I like that you start with an oversized unit and then you trim it down to perfection with the ruler. The unfinished size of your block will be 9 1/2″. Star Background: Cut (2) 4″ strips. 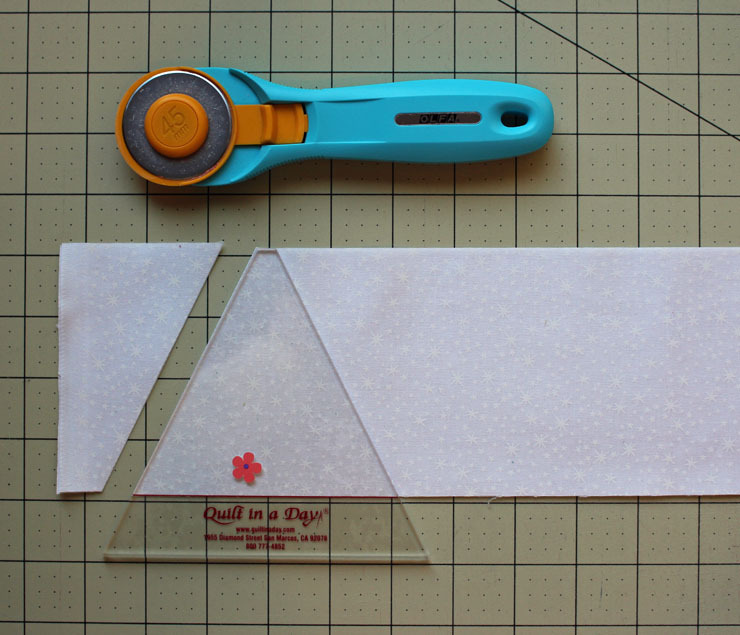 Using the triangle shaped ruler, place the red placement line on the bottom edge of strip and cut 12 center triangles. ALSO, cut (5) 3 1/2″ wide strips; subcut into (48) 3 1/2″ squares. 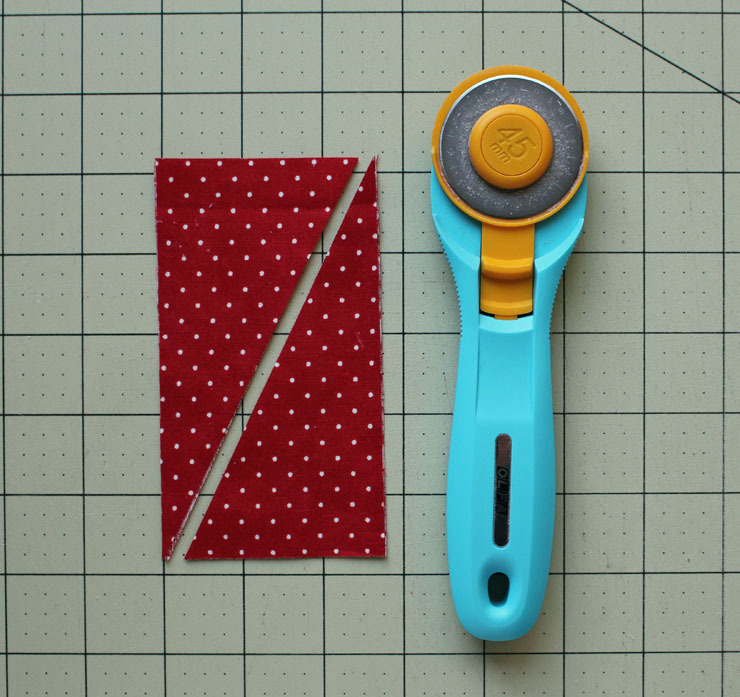 Star Points: Cut (2) 5″ strips of red fabric and (1) 5″ strip of blue fabric. Sub-cut into (32) 2 1/2″ x 5″ rectangles of red, and (16) 2 1/2″ x 5″ rectangles of blue. Star Centers (green): Cut (1) 3 1/2″ wide strip. 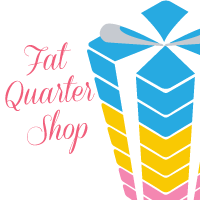 Subcut into (8) 3 1/2″ squares. 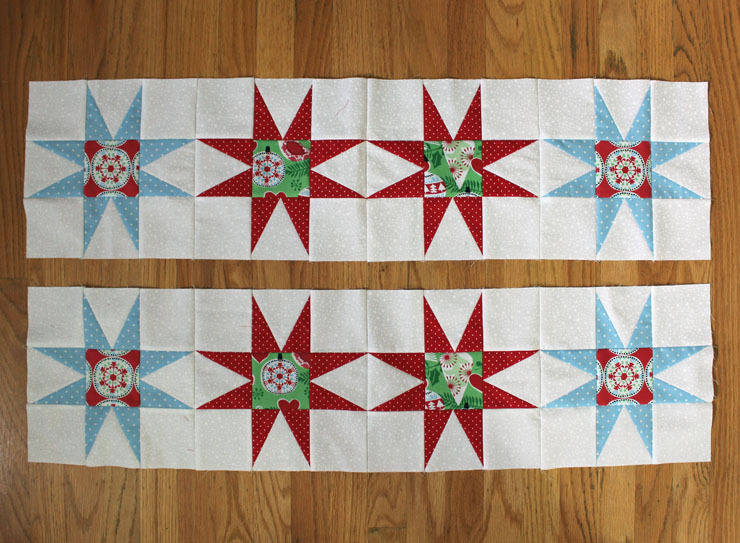 Star Centers (red): Cut (1) 3 1/2″ wide strip. Subcut into (4) 3 1/2″ squares. 1. 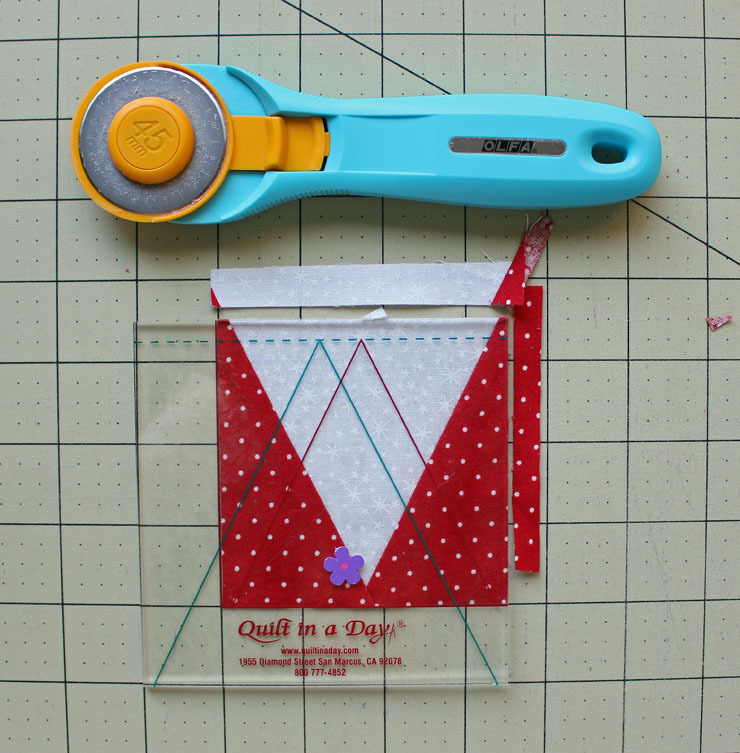 From the red and blue 2 1/2″ x 5″ rectangles, you need to cut them diagonally in half. Make sure that you are cutting them in pairs with same sides together to get a mirror imaged pair. Stitch and press towards the side-triangle. 4. 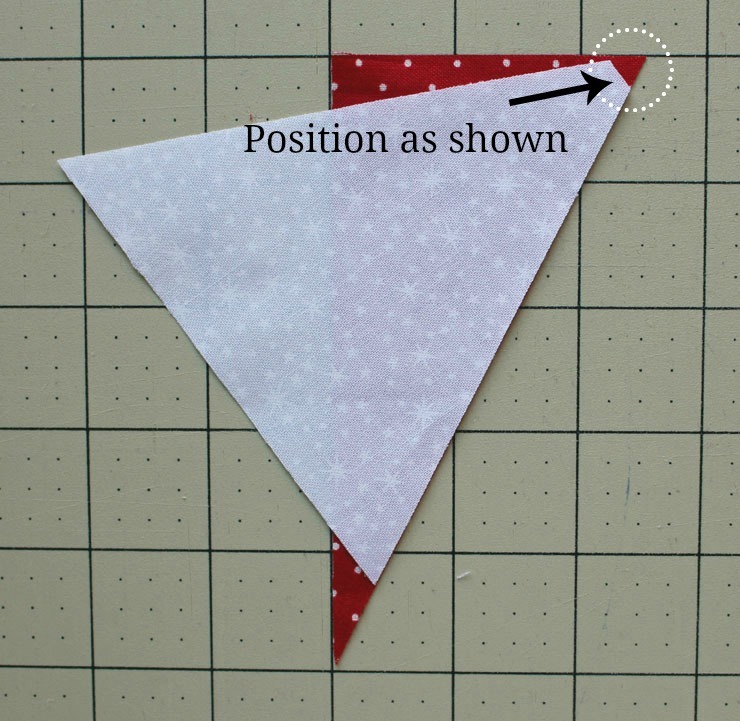 Using the square-up ruler, place the red triangle lines on the seam lines, making sure that you have 1/4″ above the top of the triangle. Trim the right side and top edge. 5. 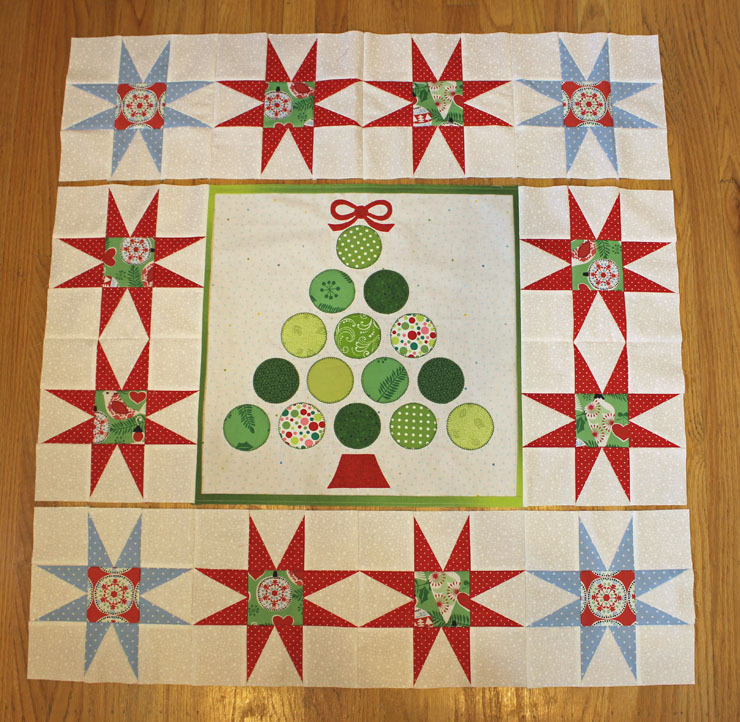 Arrange the 3 1/2″ white background squares, 3 1/2″ center squares and 3 1/2″ star points as shown. Sew into rows. Press the center row seams toward the center and top/bottom row seams towards the outside. 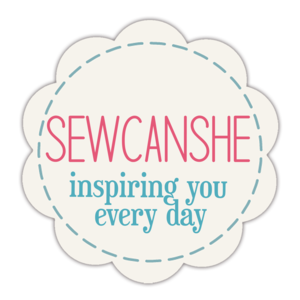 Sew the rows together, matching seams. Press towards the center. The star should measure 9 1/2″. Make 8 red/white stars and 4 blue/white stars. 1. 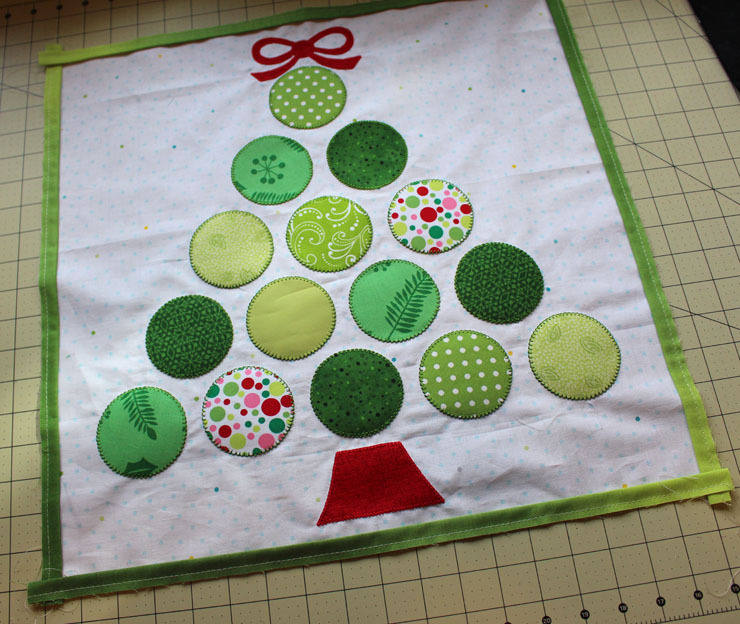 Cut the applique background fabric to 19″ square. 2. 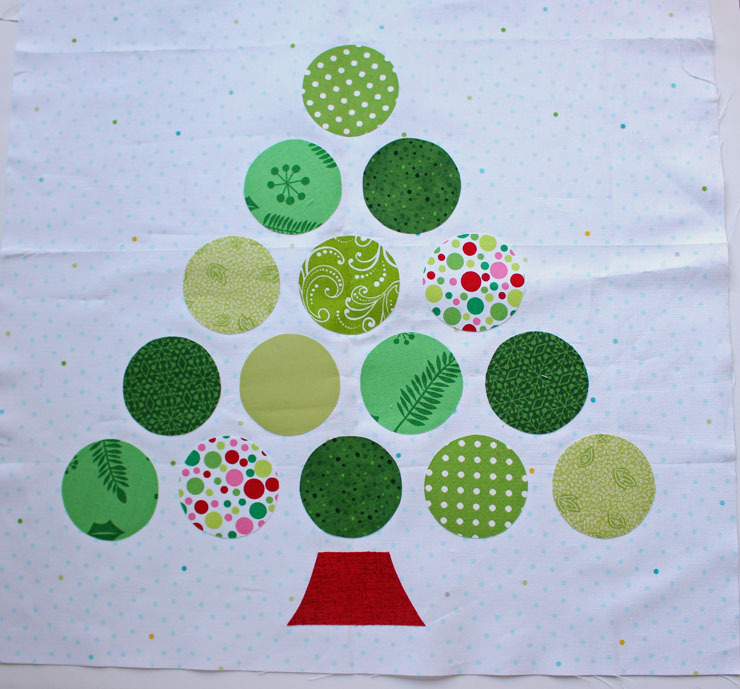 Print the pdf file with templates for the applique circles, tree trunk, and bow. 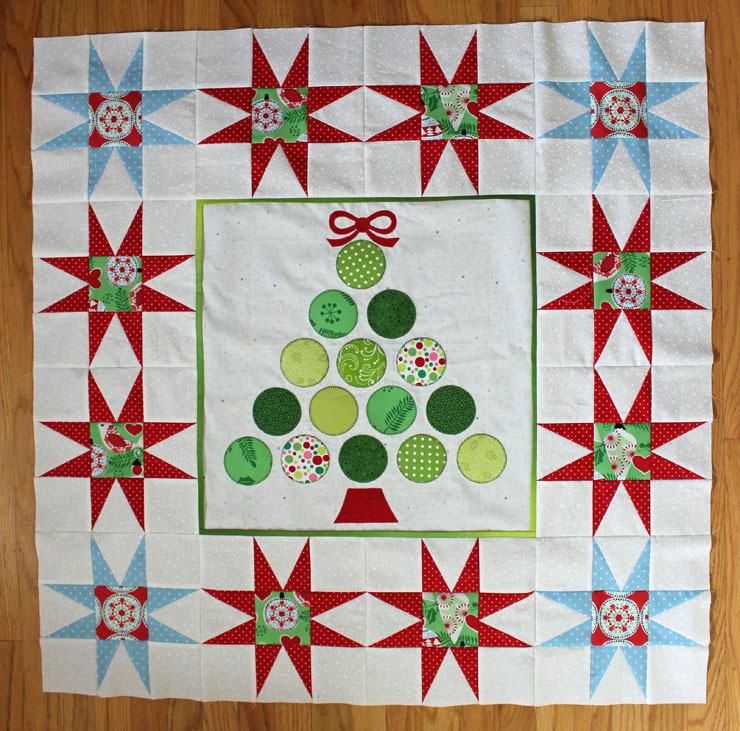 This can be found here: Christmas Tree Applique. Make sure to print this out at actual size (no scaling). 3. 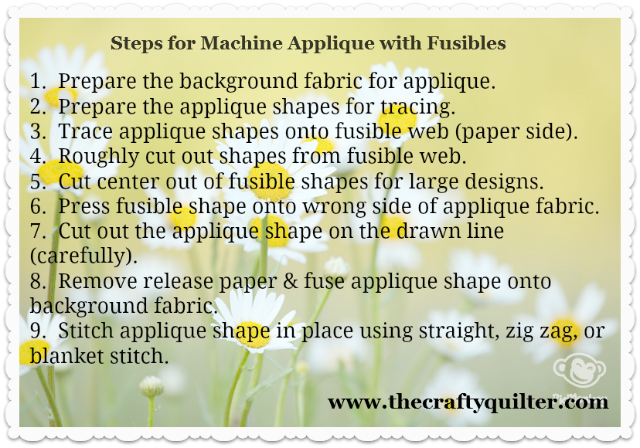 Use your favorite method for applique. I used machine applique (with fusible web) and a blanket stitch. You can find my tutorial for that here. The condensed steps are below: There are a total of 15 circles for the tree. Make them as scrappy as you want. The bottom row of circles should be about 3″ from the bottom edge of background fabric. There is 1/2″ between each circle. After stitching the applique pieces down, trim the square to 18 1/2″. 4. If desired, add a flange to the center applique. I used 1″ wide strips for mine. You can see my previous tutorial on how to add a flange here. 1. 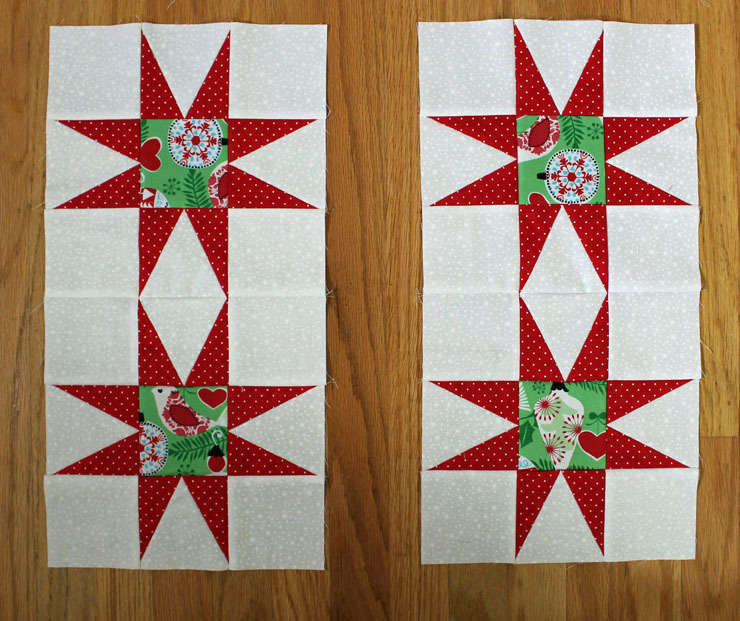 Sew 4 star blocks together for the top and bottom rows, making sure there is a blue star at each end. 2. Stitch two stars together for each side. 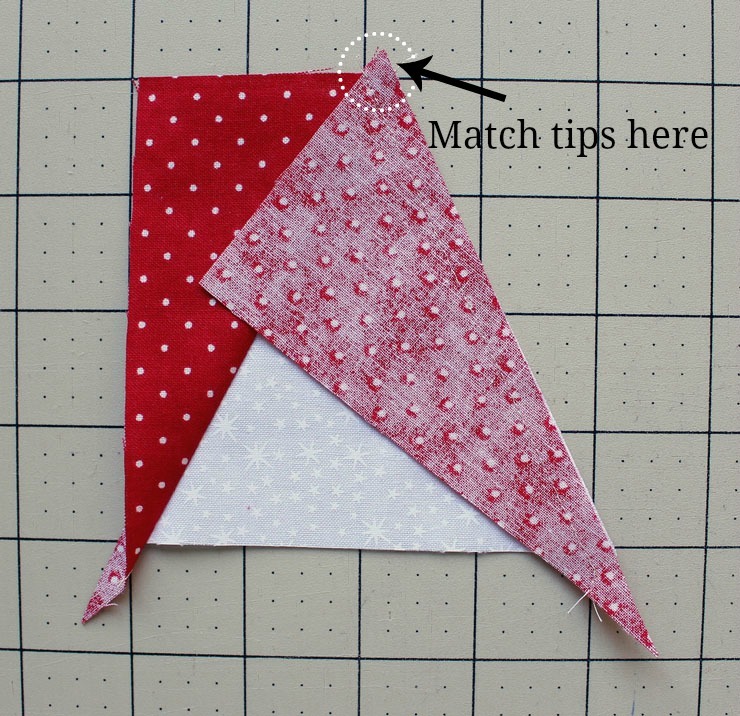 Make sure to match the seam well at the star points! 3. Stitch the two side star borders to center applique. Stitch the top and bottom star borders on. Now you get to baste, quilt and bind! Remember to add a hanging sleeve if you want. 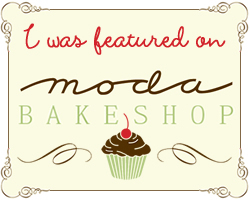 Mine is made with polka dots! 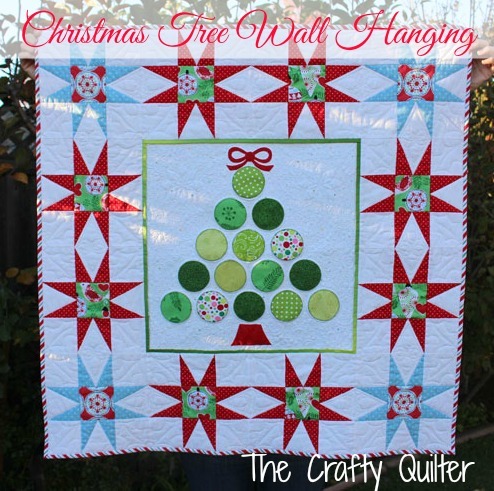 Enjoy your Christmas Tree Wall Hanging! If you make one of your own, I’d love it if you sent me a picture! I’m going to make a Flickr group for photos using my tutorials (once I figure out how). 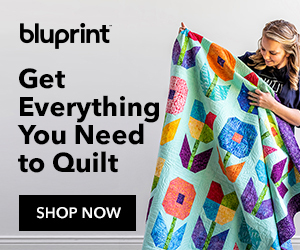 Julie, this quilt is adorable! Would love to make it with my stash. You mention a PDF but I wasn’t able to find it. Is it still available? If not, I will follow your excellent instructions in your blog. Thank you! Love the pattern and would like to make one for the Christmas holiday, fabric to die for. do you supply the fabric. difficult to get any fabric from USA TO GABORONE, BOTSWANA. I love your Christmas Tree wall hanging. I printed the instructions for my own personal use but I also had to print off 6 pages of comments. The printer I use does not allow me to view any of the pages so I had no idea I was wasting 6 pages. It would be great if your print option would print only the instructions to your design. Thank you so much for sharing your creativity. You’re the Greatest!! 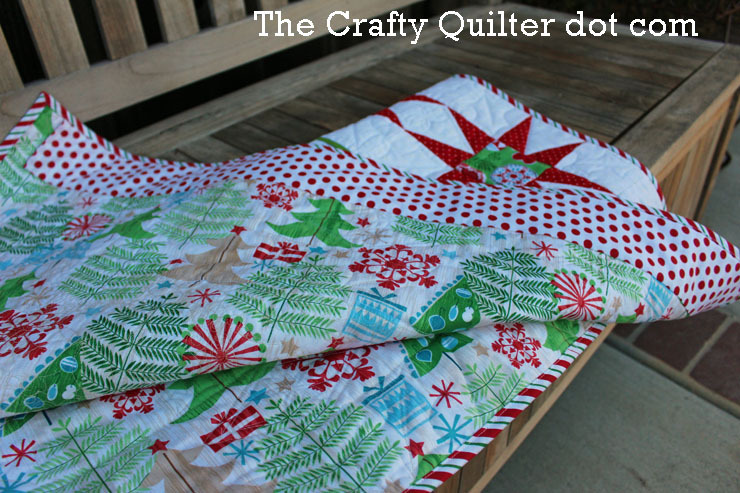 This looks so great- your quilting is amazing! So cute! You do great work, Julie. What a beautiful wallhanging! 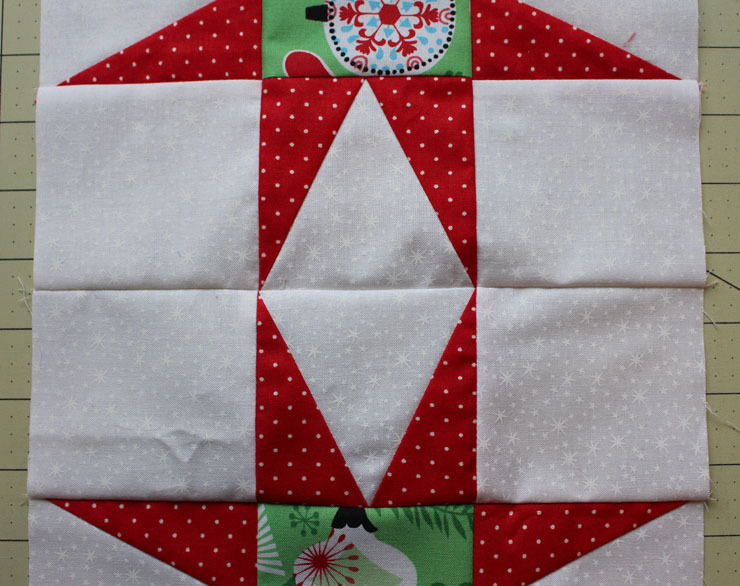 I love the blocks and your gorgeous quilting! This is an excellent tutorial, too, with all of your diagrams and pictures! Even I can learn how to make this with your good directions! Thanks so much for sharing this pattern with us! Love all your tutorials.. they are detailed and easy to follow. Just finished the crumb mat and I am pleased. Hi Julie, another beautiful project completed! 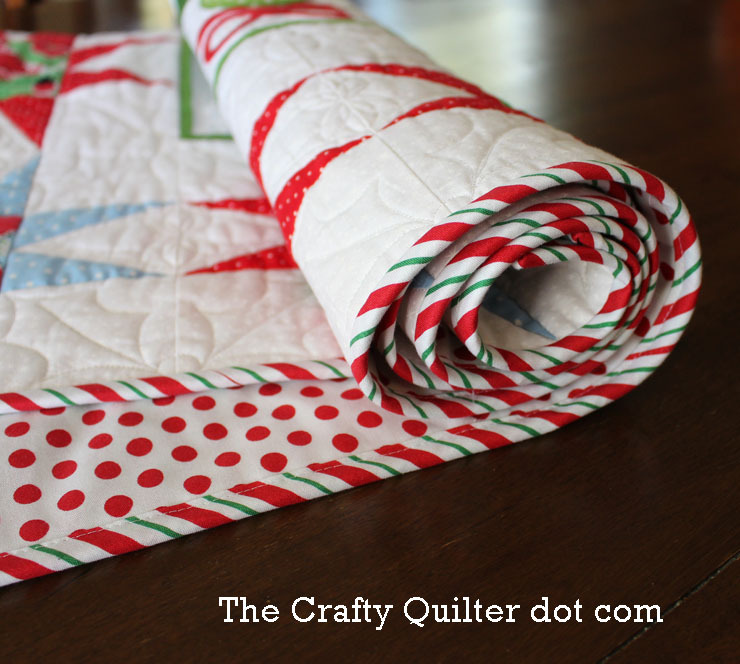 Thanks for sharing the tutorial, your free motion quilting is just wonderful! 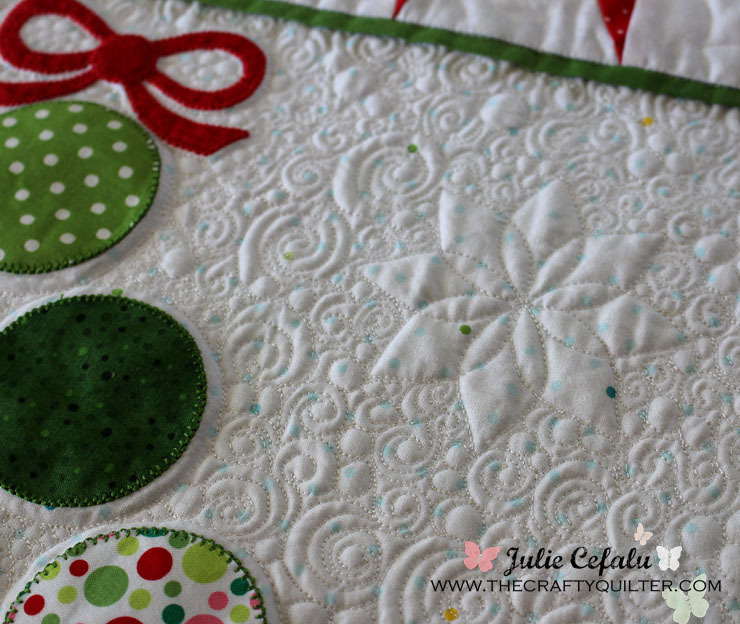 Love the colors on the clean white background an your quilting is lovely! Love this! That striped binding is too perfect. 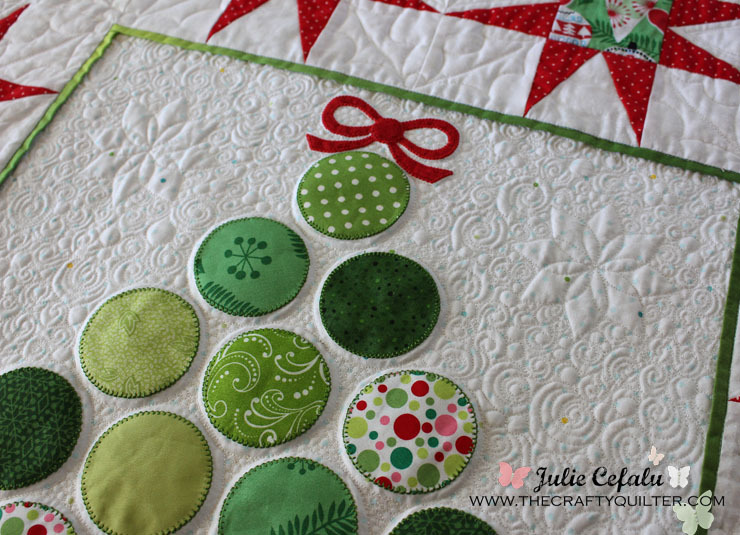 Your quilting looks awesome too Julie. I love the stars. This is adorable! 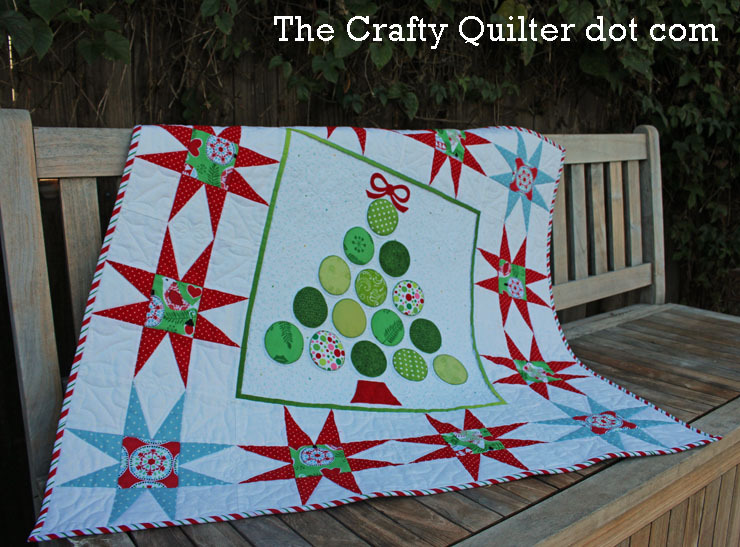 I love seeing the traditional star blocks surrounding such a modern tree, with a fabulous variety of Christmas prints. Thanks so much for the tutorial! It is so wonderful! Thanks for sharing your tutorial. I will love to make one of my own. Hi Julie. This is so cute. Thanks for sharing this pattern including all the details. It is so appreciated! 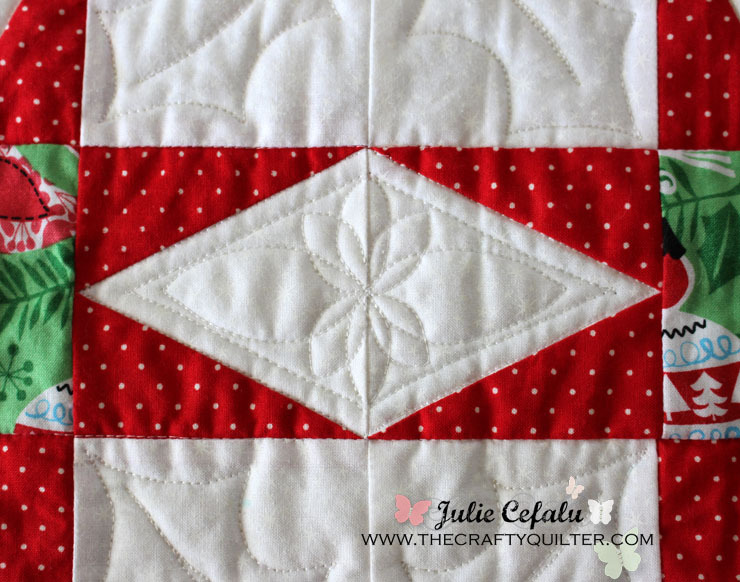 Julie, your quilt and quilting are stunning!! This quilt and machine quilting are amazing. Absolutely gorgeous! You are so kind to share with us. Thank you! This is so pretty! I love the binding, and the quilting looks amazing! AMAZING! This is just stunning, and so perfect for Christmas. 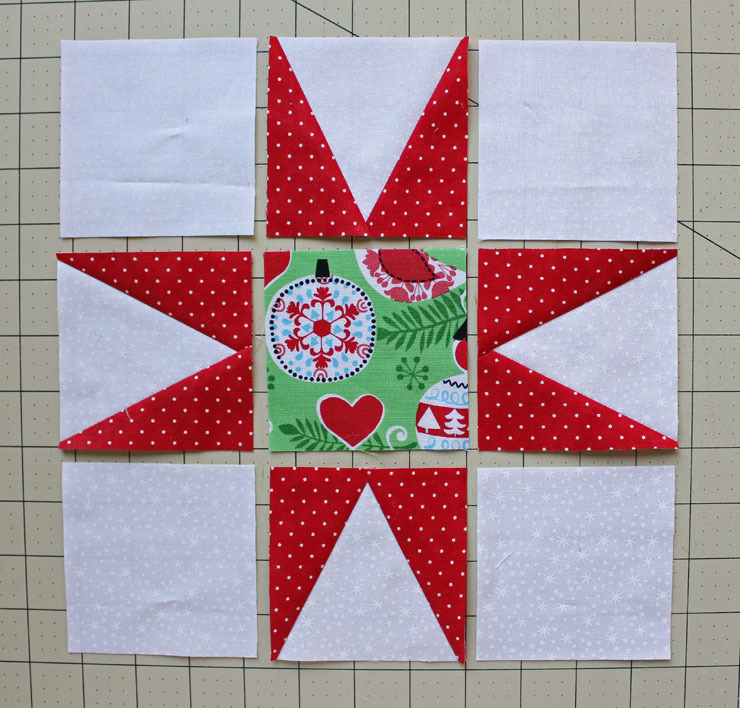 I would love to try making the star blocks, too, any time of the year. 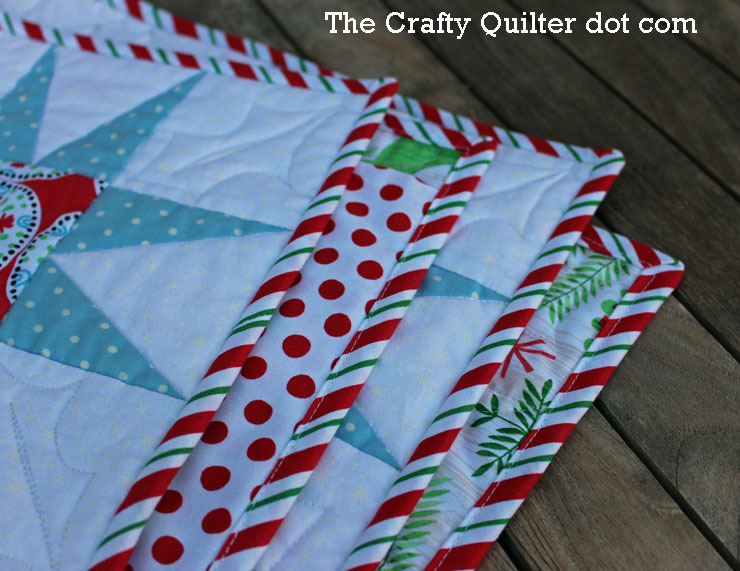 Your quilting details are gorgeous, too! Yay!!! Beautiful work, Julie, thank you so much for sharing with us all. Oh, I love it! Your quilting is gorgeous too. I plan on making one too, but can’t right now. I wish I could do it today. Sometime in the future for sure! I absolutely love it! I’m so impressed with the quilting too! 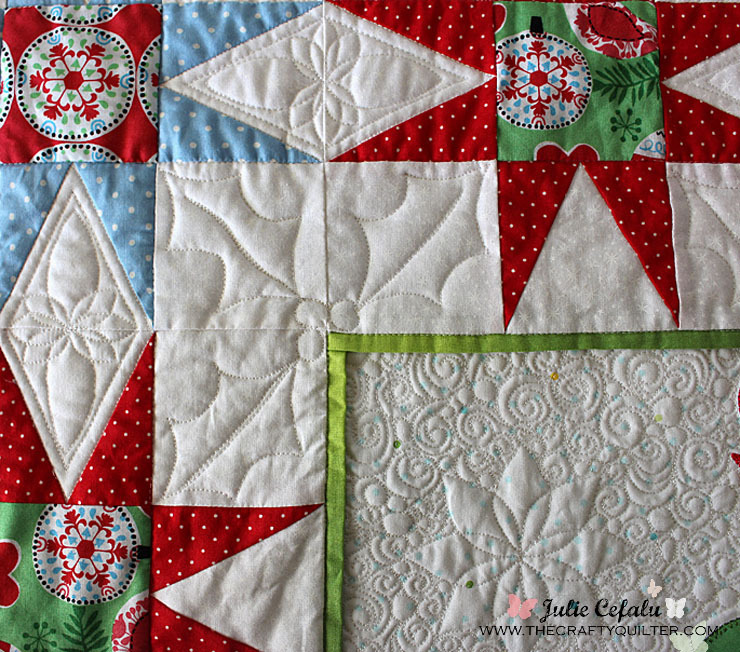 Thank you Julie, I LOVE this project, so cheery and bright! I’m planning on making one and I’ll send you a photo for sure. Thanks again! !